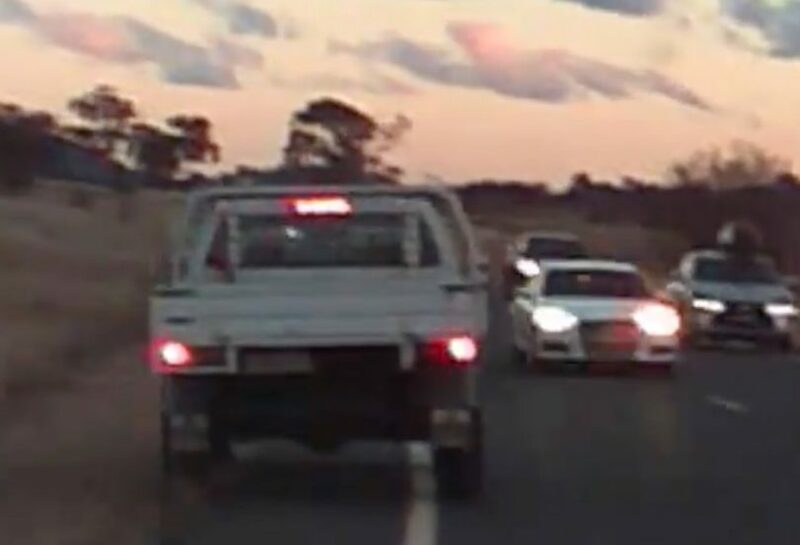 A screenshot of the dash-cam footage provided by Grace Stevens showing a close call between a ute and a white car on the Monaro Highway. In an effort to highlight dangerous driving occurring “every single week”, a Cooma woman has released dash-cam footage of a frighteningly close call when a ute is faced with an overtaking car travelling right into its path on the Monaro Highway. The incident captured dramatically on camera took place around 5 pm on Tuesday (July 31) and shows the ute swerving off the road to narrowly avoid the oncoming car which has crossed into its lane. Grace Stevens was travelling back to Cooma and was near the Ryrie Road before Bredbo when the near-miss took place in front of her. Grace said that “sadly this happens way too often, especially between Cooma and Canberra” and so she decided to post the footage on Facebook to draw attention to the problem. “I posted it to definitely draw attention to the ridiculous and dangerous driving that happens on the roads with the snowy mountain region,” Grace told The RiotACT. “People have been trying to draw attention to this problem for so long, especially with this year feeling as though it has been the worst. “I experience someone driving recklessly every single week and people dying is still not enough to stop them, which is a shame. 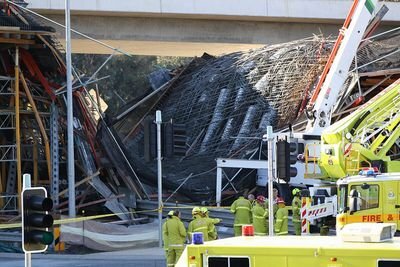 The driver, Will Wright of Berridale, has since been in touch with The RiotACT and said that the other driver’s rush to get home could have come at the cost of his life. “Unfortunately this [kind of driving] is a common occurrence in our local area, it was only Grace’s footage that made this public,” Will said. “I encourage people to invest in dash-cams, it helps raise awareness of dangerous driving such as this. Grace said she has passed the footage on to the Cooma and Jindabyne police and is waiting for them to get back to her. Below is the dash-cam footage of the incident provided by Grace Stevens. Something very similar happened to me early one morning in ’68 heading to Cooma, only three cars involved. I was following a Falcon when a car well ahead came wide around a bend, out of fog. Both the Falcon driver and myself thought it would go back on the correct side of the road. It didn’t, the Falcon braked hard slewing the car to the left which was just enough room to allow the other one through, I ran out of space and into the Falcon’s rear. The driver had been asleep. How about the third car back at 0.21, the SUV with no lights on? a dark coloured car, twilight, cloudy, same colour as the road. O.K. he may be able to see where he is going but almost invisible to others. People don’t realise that at that time of day you do not see colours so well, this car is the same TONE as the road and as I said, nearly invisible. Idiots everywhere. in Canberra, increasingly, traffic lights go green but there are still cars and even buses crossing in front, obviously running red lights. Large cars tailgating (bullying) smaller cars trying to stick to the speed limit. Cutting the corner at T intersections. Crossing the centreline / meandering the face of oncoming vehicles. And not only because the driver is texting. Pay attention, people, stick to your own lane, and be prepared to ease off the accelerator sometimes. Bang on, Jennifer. Every day I drive from Tuggeranong to Crace passing the notorious 'Gridlock' Interchange and the frequency of collisions continues to increase. Nearly always multi-car, a combination of speed, insufficient distance between cars, idiots in, or speeding along in the left lane, cutting into or pushing into non-gaps in the right hand lane between cars leaving the appropriate safe distance who are suddenly left with no distance and one touch of brakes two cars up lands them in an accident not of their own making. Don't get me started on texting...virtually every single day. Joys of sitting at lights already gone green waiting for some bozo to figure out the lights have changed while they've been busy texting. Or worse, driving hundreds of meters continuously text, glance, text glance. Cotter Road- see it all the time, and we have cyclists and dead Roos and wombats as well as live ones to negotiate. This happened to us on the Barton highway the car illegally over taking threw rocks up at our windscreen causing us to have to get a new windscreen. We are now looking at purchasing a dash cam. I have only been driving or riding a motorcycle on that road since 1980, so don’t really feel that qualified to comment. In my view it is not that bad a bit of road if you are aware of the risks. If you give yourself a 3 to 5 second gap it can become quite a smooth trip. I find a lot of people using it drive like they are on Northbourne Ave.
Moving to the video. Firstly, the guy driving the ute did everything correct and as others have said needs congratulating. The flog driving the white Audi did pretty much everything wrong and should have their licence pulled and car crushed without delay. The driver with the roof box on should have moved over earlier. The 4WD ute driver is certainly way too close to the car in front and made sure the Audi had no chance to safely pull in. Did they actually speed up to hinder the overtaking manoeuvre as some on that road do? Grace should probably also look at the separation distances she uses because if it had gone totally to custard she may well have been caught up in a multi vehicle crash. I will add the disclaimer that those dash cams tend to distort distances somewhat. I notice NSW Police have established Strikeforce Puma for investigating, amongst other things, bad driving videos that appear on social media. I await a similar initiative for this side of the border, but don’t expect it in a hurry. Happens all the time along there. Half the issue is that there are way too few overtaking lanes, and way too many people doing 20 under the limit until they get to an overtaking lane, where they miraculously start doing 110-120. Other one is people towing caravans that way exceed their vehicles towing capacity, doing 70, and have a mile of traffic backed up behind them but are too inconsiderate to pull up and let people pass. People end up getting frustrated and do stupid and dangerous things to overtake. Either put in more overtaking lanes, or police both sides of the stupidity. Happen twice in a matter of 15 mins this time last year on the way home from cooma. Cars heading to the snow quite scary. Why do Coomarians hate winter? Is it the cold? No. It’s the idiots on the highway!!!! Why do people never learn?! Damn straight, a code brown moment if ever there was one. Avg speed cameras to make an example. What do you expect police to do if you report dangerous driving? They didn't see it, YOU did. So of course they will ask for as much information as YOU can give and yes, as YOU witnessed it, YOU should be expected to provide a statement and give evidence in court if needed. Holy moly! On dusk and all. This is right near my house! Carolyn I don’t envy your drives into town.